Erin is a cousin of my friend Aytuğ Sözüer. 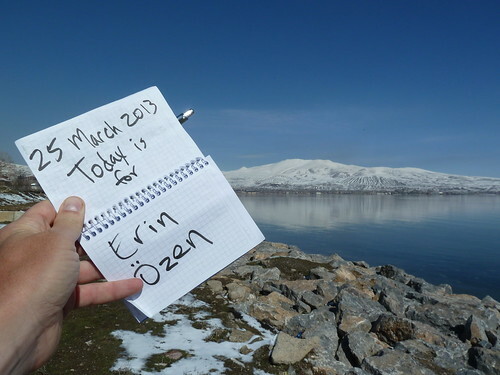 She joined us for breakfast in Istanbul back in August, and has followed the walk since (hello Erin!). Today’s walk was 32 kilometers (20 miles) from Tatvan to the village of Yelkenli. It was a nice, sunny day, and the views of Lake Van were incredible. At the end of today’s walk I was trying to hitch a ride back to Tatvan. Hitching a ride is unpredictable — sometimes it takes 20 seconds, sometimes it takes 90 minutes, and you never know which one it’s going to be. This afternoon I tried unsuccessfully for a full hour to flag down a ride. The police noticed I was having trouble. They stopped and flagged down the first car that came along. I was back in Tatvan in no time at all.